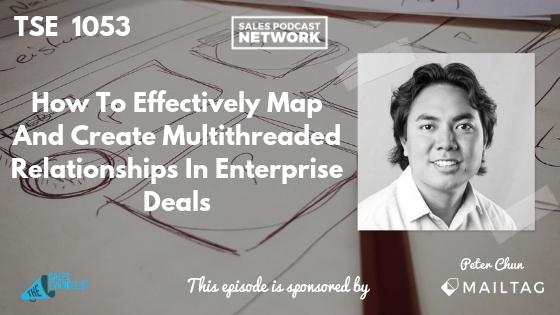 Sales constantly evolves and sellers who want to be successful must effectively map and create multithreaded relationships in order to close more deals. Peter Chun talks today about the importance of multithreaded relationships and the challenge for reps who must establish them. 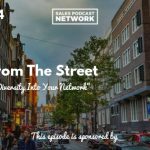 Peter fell in love with the convergence of sales and data and has found a personal passion for it. He loves strategizing about how to close deals and about how to help your company scale and grow. The biggest obstacle for B2B sellers right now is the evolving face of sales. Buyers are more sophisticated, and they have more information at their fingertips. They do a lot of research before they even engage with a salesperson. Additionally, the number of stakeholders within B2B deals is increasing, with research indicating that complex deals often include 6 to 10 stakeholders. The big challenge, then, is finding and creating multithreaded relationships because too often they are single threaded. Many reps, either because of laziness or lack of awareness, fail to establish more than one relationship within a deal. They rely on a single relationship to get the deal done. Being multithreaded doesn’t simply refer to your customers. It’s important that sellers create multithreaded relationships within their own companies as well. Who else, besides your prospect, needs to be part of the conversation you’re having? Who else on your team has relationships that can be leveraged to build a solid foundation? One of Peter’s reps teaches his reps to always do discovery because it keeps them aware of the details of the deal and helps them to stay relevant. If you’re multithreaded, you have other contacts that can help you move a deal forward. Even when you believe that you have the juice to close a deal, you leave yourself open to risk if you fail to be multithreaded. 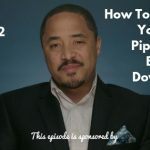 You may, in fact, be connected to the right person, but that doesn’t mean there aren’t others who can help move the deal forward as well. Many reps simply haven’t been coached to do this well. Sales leaders must coach them well and teach them how to have a multithreaded perspective. In the case of a complex account, there may be hundreds of employees. There may be years of history between you and your prospect making it difficult to know where to even start. Peter says that visually mapping the process will help you keep track of your efforts. Where does each employee sit? Who does each employee report to? What are the relationships within that organization? In order to establish a multithreaded perspective, begin by figuring out all the people you already know. Start with who you’ve met or spoken to in the organization. Step two is to identify all your targets or the people you’d like to talk to. Third, add the executive team. Include the CEO and any executive leadership that you think is relevant to the conversation. You can then figure out who reports to whom and who is pursuing specific initiatives. The goal is to drive consensus across the organization, so I must identify the leaders who can move this initiative forward. Recognizing your prospects’ initiatives demonstrates an interest and it suggests that you’re more than an order-taker; you’re paying attention to the details. Some managers get so focused on their numbers that they fail to develop a real strategy. As soon as organizations allow their sellers to be a little more strategic, they’ll find that their activities are much more scalable. Account mapping has been around for a long time, but now we have the technology to use a more systemized approach to it and tie it into our CRM. Young sales leaders simply haven’t been exposed to enough deals to think that way. But great sales leaders think that way naturally. Help your less tenured sellers learn to think that way. It’s easy to get overwhelmed with this idea but begin with your top account. Implement the three steps with that account, will help you begin really moving your deals. Build the discipline within yourself and your team to be multithreaded. Even if you’re certain it will close, you can still consider who else you have access to. When you’re multithreaded, you have more options when your contacts go dark. Remember to focus on internal and external connections. You can connect with Peter on LinkedIn and you can sign up for LucidChart and check out their sales templates.